2014 was a drought year of extreme dimension. As a winegrower, I feared what to expect with only fourteen inches of rain to carry the vines through the long growing season. This was unprecedented in our seventy-year history as a wine estate. What to do? Protecting the long-term health of the vineyards I've planted and cared for all my life was more important than anything else. So we cut way back at pruning and reduced the crop by 50%. Harvested in mid-August (the new normal?) the fruit was surprising-- with full acidity and flavor. 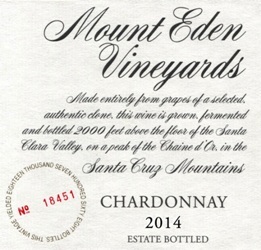 This Chardonnay has aromas that are penetrating with lemon, hazelnut, and gardenia blossom. It is invigorating on the palate, with flavors of lemon, earth, and pear. Super long on the finish, this predicts a twenty-year life in the bottle.